These delightful books for toddlers and preschoolers each tell the story of an important journey from the Bible. They are presented in a unique di-cut, fold out format, and feature bright pictures with a zippy narrative! 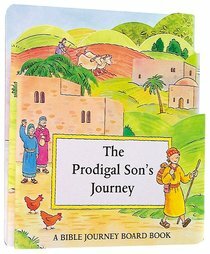 About "Bible Journey: Prodigal Son's Journey (Bible Journey Board Book Series)"
The Prodigal Son's Journey is one of three concertina books by Charlotte Stowell, allowing the Bible story to be told in pictures, with the advantage that the child can add his or her own words, after having been told the story.